The Pepperdine University Fine Arts Division Theatre and Music departments will present the Luciana and Daniel Forge Fall Musical, BIG FISH - 12 Chair Version, by Andrew Lippa, with a book by John August, at Smothers Theatre in Malibu at 7:30 PM Thursdays through Saturdays from November 9 through November 11, and November 16 through November 18, with a matinee performance on Sunday, November 12, at 2 PM. BIG FISH - 12 Chair Version is a fantastical new musical that follows the life of Edward Boom, a traveling salesman who lives life to its fullest. Edward's larger-than-life stories delight everyone around him—most of all, his devoted wife, Sandra. But their son Will, about to have a child of his own, is determined to find the truth behind his father's epic tales of witches, giants, and mermaids. 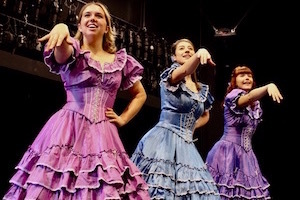 Overflowing with heart and shifting between present day and a storybook past, this musical brings a family together and reveals the true meaning of friendship. Pepperdine professor of theatre and fine arts divisional dean Cathy Thomas-Grant will direct the all-student cast, which features Noah Archibald, Nate Bartoshuk, Alden Dodd- Bettencourt, Malone Blaich, Sydney DeMaria, Marcella Ferrarone, Brandon Gille, Fernando Grimaldo, Joe Hebel, Lauren Jennerjohn, Parker Johnson, Buddy Kennedy, Kate Klimist, Natalie Leonard, Audrey McKee, Michael Mossucco, Ryan Robinson, Evatt Salinger, Katy Semple, and Angelo Silva. Ticket prices range between $10 and $20, and are required for attendance. For additional information about the musical, and to purchase tickets, visit the Center for the Arts website.